This individual Report Account-Level Processing: Taking a Swipe at Payment and Loyalty Convergence is available for purchase. This Report is available to members of Mercator Advisory Group’s Credit Advisory Service. Please be advised that this Report is normally part of a research and advisory service that provides ongoing support throughout the year. As such, this Report contains significant depth of content that is selected for its strategic importance to our members. (For a description of these services, see our Advisory Services section). This report focuses on Account-Level Processing (ALP), alternately known as Account-Level Management (ALM), which has the potential to revolutionize the payments landscape by optimizing the value that inherently exists within the data created by card-based electronic payments, thereby fundamentally changing the way consumers and merchants transact, as well as the way the general card payment services industry functions. What Account-Level Processing encompasses is, at its core, network-level instructions on how to treat individual bankcard accounts and transactions at each step of the payment process. What all of this means is that consumers will get to keep their card number no matter what type of credit account they hold at the card issuer, but also that issuers and acquirers are no longer constrained by handling card numbers at the aggregated level. 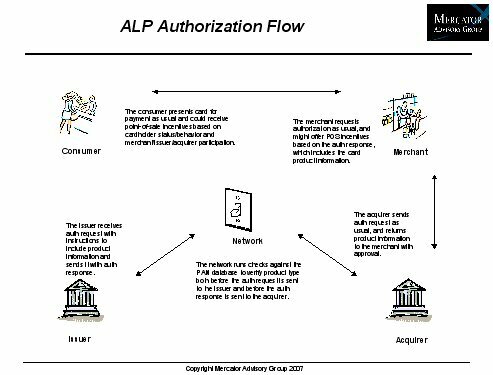 A very high-level, but fundamental interpretation of the concept would be that ALP is a decoupling of product definition and transaction data routing, the two of which have been heretofore inextricably tied. In the old environment, Bank Identification Numbers (or BINs) and their product code suffixes, the coded digits that begin all of an issuer's cards "of a feather," both identified the card's product features and defined routing and handling instructions for all touch-points. They act as coordinates that serve to navigate transaction data through the appropriate channels and get them where they need to go. The limitation of defining card products by BIN are significant, given that issuers must lump cardholders together in a portfolio that offers no chance for differentiation between them, and it restricts the issuer to a complex, and expensive process for graduating cardholders when needed. Since the networks' recent upgrades to systems using 64-bix microchips transmitting data on broadband cables, the amount of information that can be "stuffed" into the "transaction envelope" has grown. Coded intelligence, or data with a duality of meaning, has been expanded on (while simultaneously being subverted as old codes gradually lose meaning) due to the flexibility that is afforded by greater differentiation within the transaction message. Since more robust technology affords capabilities for passing more data in the data set, the inclusion of non-financial data is facilitated, such as SKU-level itemization for Level 3 data in B2B transactions or IIAS for healthcare transactions. 1. Account-Level Processing is positioned to change the entire payments industry landscape, from the way that issuers obtain, manage, and retain cardholders, to the way that merchants obtain, manage, and retain customers. 2. The bankcard networks, with recent upgrades to their processing infrastructures, have begun to implement strategies that can theoretically enhance the value of card payments to all participants in the payment chain. 3. Issuers stand to greatly increase interchange revenue as they convert their non-rewards card portfolios to higher tiered card product platforms. Acquirers should also anticipate the lift in discount revenues. 4. Merchants will also feel a lift at the point of sale, as targeted rewards engage the most valuable cardholders to increase spend while their loyalty to the merchant is reinforced. 5. Consumers can come to expect greater value from the payment experience too - value that may have a material economic impact on a national, if not global scale. David Fish, Senior Analyst in Mercator Advisory Group's Credit Advisory Service and principal analyst on the report, comments, "In segments of today's card payment space, there is a rising perception that the value of merchant card acceptance is economically out of balance with the value of cardholder float and reward, and card issuer interchange fee-based income. Interchange pricing is the only system of value exchange in which competition raises prices instead of lowers them. Simply upon the fact that card networks are in aggressive competition with each other for issuers does the interchange rate controversy turn. In keeping with the blue-sky theme of this report, we must explore the idea of ALP's latent potential for mollifying the recent outcry coming from the merchant community regarding the cost of card acceptance, namely that some merchants believe that there is more cost than value in accepting plastic for payment. Wringing more value out of the payment infrastructure at the account level and enhancing the propositions to the participants in the value chain gives the industry exactly what it needs to give fresh justification for interchange in the face of merchant and acquirer concerns." This report is 33 pages long and contains 10 exhibits.